The design of any air dryer is critical to its life span, with many, especially the smaller types for air compressors with capacities from 0,38 to 1,5 m³/min built to a price. There are a number of components that make up a ‘normal’ dryer. They are a Freon compressor, a heat exchanger to cool the compressed air to 3°C and the finned condenser coil with its electric fan. It is the condenser coil and the fan that more often than not causes a dryer’s premature failure. The fan, on small capacity dryers, runs in a bush not a bearing. Atmospheric dust and dirt can cause the bush to fail, which burns out the fan motor. When the fan stops the Freon system gets excessively hot, which burns out the Freon compressor winding as well. The result is an expensive repair requiring a new Freon compressor and fan motor, along with a gas refill and labour costs. If the fan bush does not fail, the close fin design of the condenser is the next potential cause of failure. As dirt blocks the cooling air flow through the condenser the gas temperature rises, the fan switch overworks and the bush works harder along with the fan motor. Either elevated gas temperature causes a Freon compressor winding failure, or again, the bush fails, result, an expensive repair bill. The TX Series of air dryers is unique in that it is designed to work under all site conditions. It has a static condenser, much the same as a wide spaced domestic fridge/freezer panel. It is an evaporative cooler with no fan, which means no fan motor or bush, and no close fin spacing so dirt cannot accumulate on the condenser coil. There are only three moving parts on the dryer, a timed electric condensate drain, the Freon compressor and a rotary dew point indicator. The Freon circuit is very different to a ‘normal’ dryer. 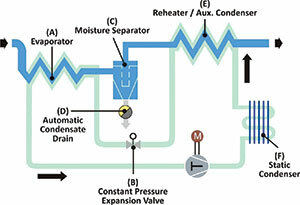 The gas leaving the compressor is passed into the static coil for cooling, using cooler atmospheric air, than the air to the Freon re-heater exchanger. This cools the hot Freon and simultaneously re-heats the c/air ready to enter the air line. The gas then passes to the main air to Freon exchanger to cool the compressed air to dew point. From there it returns to the compressor. It is probably the most reliable simple design ever used in the compressed air industry.